AC Milan have continued where they left off from last season after they managed a convincing 2-1 win over Valencia in the pre-season friendly match. The match took place at the famous Mestalla stadium and Milan dominated from the start. Robinho, who recently agreed a new deal to extend his stay at the San Siro, scored the opening goal with a brilliant finish in the first half. Former Manchester city defensive midfielder Nigel de Jong then doubled Milan’s advantage from a long-distance shot. It looked like Milan were going to end the match in a comfortable fashion. However, ftbllr football blog reported that Dani Parejo pulled one back for Valencia and it threatened to destroy the perfect start for the Italian club, but they held on for a good victory. Milan manager Massimiliano Allegri recently stated that he does not think his team will be one of the favourites for the title. He thinks that the presence of Juventus and Napoli mean that Milan have to work extremely hard enough to even come close to a top three place. Despite the victory, there were concerns about the fitness levels of the players, as they began to tire late in the match. Allegri, though, expects this problem to reduce as the pre-season continues. “It was a very intense match. I wanted to see if the team was in the right physical and psychological condition. We need to improve, as at the end we were struggling to stay on our feet, but for the moment I am satisfied. It was important to have a strong performance, especially in defence. Some players need a little more time on the field, but we always play to win, as victories help you to work better. We’re on the right track, though we have to do better in the final third,” said Allegri. New Manchester United manager David Moyes has hinted that the club’s Italian striker Federico Macheda and Portuguese midfielder Bebe have no futures at the club after both the players were left out of the club’s pre-season tour to Asia and Australia. Macheda burst on to the scene in 2009 when he scored a last minute winner against Aston Villa to effectively hand United the title in his debut match for the Red Devils, but since then, he has failed to get into the team at any time and although he was given his chance by Sir Alex Ferguson in the League Cup matches and a few Premier League matches as well, but he never managed to get settled. The latest online betting odds make AC Milan joint favourites for his signature. Sir Alex wanted the player to get as much exposure as possible and loaned him out to Italian club Sampdoria in January in 2010 but he only managed a couple of games at the club before they were relegated. Having spent last season on loan at German club Eintracht Frankfurt, the Germans are now trying to thrash out a deal to bring the player permanently to Germany. 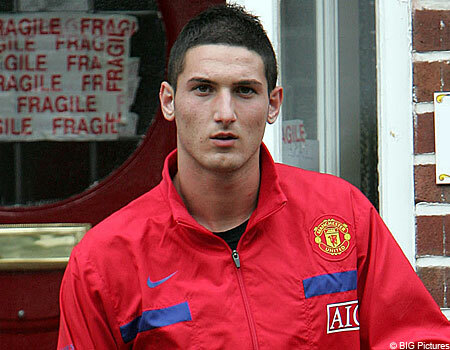 Federico Macheda also spent some time on loan at Premier League side Queens Park Rangers. Meanwhile, Sir Alex Ferguson’s big gamble in Bebe has also failed to pay off and United are looking to offload the Portuguese player to free up some funds. Bebe has not played a competitive game for Manchester United since he was sent on by Sir Alex Ferguson in a League Cup match in 2011 and spent the last two seasons on loan, first at Besiktas and then back home in Portugal with Rio Ave.
With Moyes now assessing the players at his disposal at the club in pre-season, it seems Federico Macheda and Bebe are completely out of his plans.